The significance of environmental sustainability and related topics such as climate change to international development is reflected in its explicit mention in the Millennium Development Goals, specifically MDG 7. 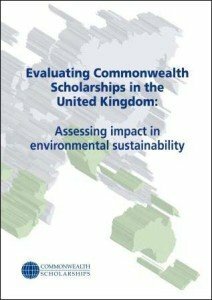 This report looks at the impact of Commonwealth Scholars and Fellows in the area of environmental sustainability, and provides further evidence to suggest that international scholarships and fellowships have an impact on development, and particularly in the environmental and agricultural sectors. The report begins by outlining the awards that the CSC has offered to Scholars and Fellows in the area of environment, providing background on the numbers and types of award held and on those who held them. In the following section, the report moves on to its main source of data, namely the responses of a subset of the 2,226 alumni who completed an in-depth impact evaluation survey in 2008 and reported having an impact in one of three relevant areas: Environment Protection, Physical Infrastructure, and Agricultural/Rural Productivity. Further data was obtained from a follow-up survey sent out in December 2011 to 390 alumni who had reported having an impact on projects and on policy in relation to the aforementioned three environmental priority areas. This survey yielded 65 case studies, some of which are explored in the fourth and fifth chapters of the report.